For years, scientists have been inspired by nature to innovate solutions to tricky problems, even oil spills — manmade disasters with devastating environmental and economic consequences. A new USC study takes a cue from leaf structure to fabricate material that can separate oil and water, which could lead to safer and more efficient oil spill clean-up methods. In addition, the material is capable of "microdroplet manipulation," or the transfer of miniature volumes of liquid. Droplet-based microfluidics is a tool used in various applications like cell cultures, chemical synthesis and DNA sequencing. Using 3-D printing, Associate Professor Yong Chen and his research team at the Daniel J. Epstein School of Industrial and Systems Engineering at the USC Viterbi School of Engineering have successfully mimicked a biological phenomenon in plant leaves called "Salvinia effect." Their study focuses on a floating fern native to South America called Salvinia molesta. The unique leaves are super-hydrophobic, meaning "water-fearing" and retain a surrounding air pocket when submerged in water due to the presence of water-resistant hairs. "I think the reason the plant's surface is super-hydrophobic is because it lives on the water and requires air to survive," Yang Yang, a postdoctoral researcher on Chen's team, said. "If it weren't for the long-term evolution of this plant, the plant could be submerged in water and would die." On a microscopic level, the leaf hairs align in a structure resembling an egg-beater, or cooking whisk. Chen explains that Salvinia's leaf surface is comprised of this so-called "egg-beater" structure that is super-hydrophobic. Using a method called immersed surface accumulation 3-D printing (ISA-3D printing), the research team successfully created the egg-beater microstructure in samples made from plastic and carbon nanotubes. Chen explains that the method allowed the team to demonstrate the fabrication of a material with both super-hydrophobic and olephilic (oil-absorbing) properties that, when combined, generate capillary forces capable of highly efficient oil and water separation. "We tried to create one functional surface texture that would be able to separate oil from water," Chen said. "Basically, we modified the surface of the materials by using a 3-D printing approach that helped us achieve some interesting surface properties." The team has 3-D printed a prototype, citing a growing demand for materials that can separate oil and water mixtures efficiently in vast bodies of water. Eventually, they hope the technology can be applied to manufacture materials in large scale to accommodate massive oil spills in the ocean. Current methods require tremendous energy in the form of an electric field or mechanically-applied pressure. "Salvinia effect" also has potential for liquid-handling technology that executes "microdroplet manipulation" –a breakthrough where the adhesion of liquid to a robotic arm can be tuned accordingly and result in non-loss transfer for very tiny amounts of liquid. 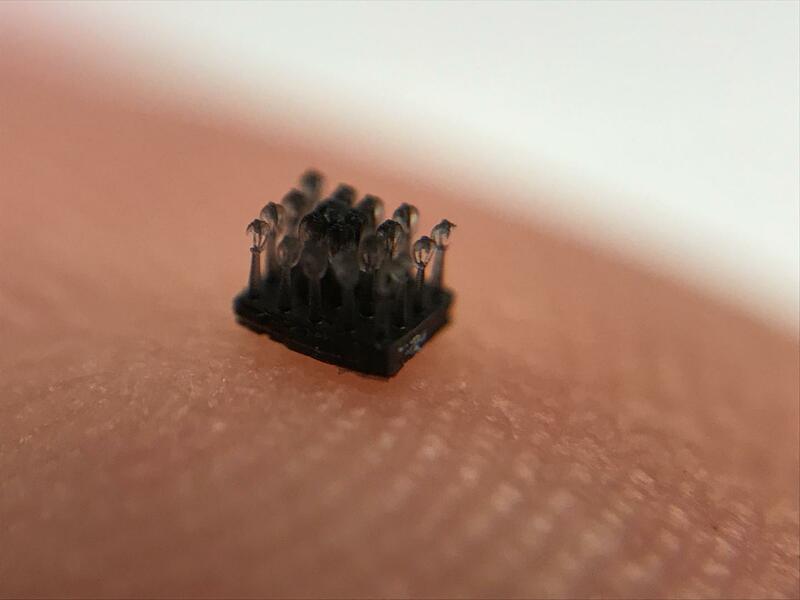 The technique can be applied in myriad ways, some of which include droplet-based microreactors (devices used in chemical synthesis), nanoparticle synthesis, tissue engineering, drug discovery and drug delivery monitoring. Xiangjia Li, a PhD student on Chen's team and co-first author of the study, says one example of high-performance microdroplet manipulation could lead to more efficient blood analyses for patients. A robotic gripper could move to different stations and dispense microdroplets of blood that are then evenly mixed with different chemicals for various tests. In addition, the tests could be designed to control the ratio of chemical to droplet and result in significant conservation for source materials and chemical reagents. "You can have a robotic arm with a gripper made to mimic 'Salvinia effect,'" Li said. "No matter which way you move the arm, the gripping force is so large that a droplet will stay attached." Led by Chen, the research team also included Yang, Li, Professor Qifa Zhou, and graduate students Xuan Zheng and Zeyu Chen. Their study titled "3D-Printed Biomimetic Super-Hydrophobic Structure for Microdroplet Manipulation and Oil/Water Separation" has been published in the Vol. 30, March 2018 issue of Advanced Materials. The team also produced a video illustrating the technology.